Aug 22, 2016 – For this episode, our time machine takes us back to the aftermath of the First World War, where we’ll visit a defeated member of the Central Powers that targets ethnic minorities for wholesale slaughter. It’s not Nazi Germany, but Ottoman Turkey — in the final chapter of their genocide against Greeks, Armenians and other Christians, that the nation denies to this day. 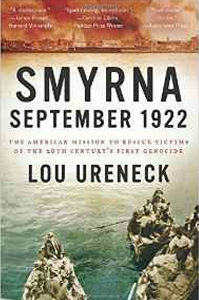 Our guest, Lou Ureneck, is a professor at Boston University, and author of Smyrna, September 1922 – The American Mission to Rescue Victims of the 20th Century’s First Genocide . His book was published in hardcover as The Great Fire, a fitting title since the term Holocaust itself comes from the Greek words for “whole” and “burned.” The cosmopolitan, diverse city of Smyrna is long gone, and Turkey’s Izmir built on its ashes. This is the story of how two men — a low-level YMCA minister and a U.S. Navy officer, bucked the American government and a tide of indifference or outright hatred, to save over a million ethnic Greeks from certain death. You can learn more about this tale of cruelty and heroism, by visiting SmyrnaFire.com, Facebook.com/LouUreneckAuthor, or following at @LouisUreneck on Twitter. On a personal note, both James and Argyro Karayanis, Dean’s grandparents, hailed from this area of Asia Minor, and had their families wiped out by the Islamic Turks, who saw the native inhabitants of Anatolia and others like the Pontian Greeks and Assyrians, as infidels to be treated like — as Mr. Ureneck describes it — African-Americans in the Jim Crow South. Visit the Greek Genocide Resource Center at Greek-Genocide.net for more on this atrocity, and check out the St. Photios Greek Orthodox Shrine in St. Augustine, Florida, founded by Greeks who migrated from Ottoman-occupied Greece in 1768 and founded the New World’s first Orthodox Christian settlement: New Smyrna. We leaned heavily on the genealogy work of Catherine Karayanis in this episode, to piece together the Karayanis Family Tree — considered an impossible task for most who assume everything as “burned by the Turks.” Hellenic listeners in particular may want to check out what’s possible thanks to modern DNA technology and resources like Ancestry.com.